This exciting vacation introduces you to the rich history, scenic wonders, and cultural treasures of China and Tibet. Start in Shanghai, China’s center of trade. Here, walk along the Bund, see stunning displays of ancient bronze and jade at the Shanghai Museum, and enjoy a traditional dim-sum feast. You will also attend a high-flying acrobat show and take a fascinating walking tour through the former French Concession where tree-lined streets and Art Deco architecture transport you to a bygone era. 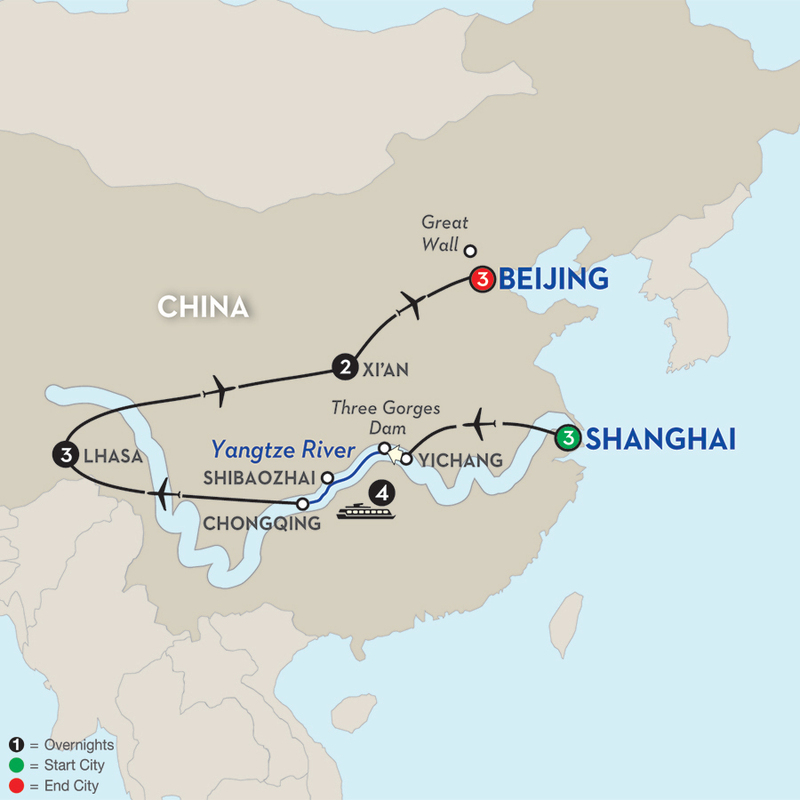 Then, fly to Yichang and begin your Yangtze River cruise with a private welcome reception on board the Century Legend. Shore excursions include a walking tour of a riverside community to see its beautiful pagoda, a tour of the Three Gorges Dam site, and a small boat cruise on the emerald-green waters of Shennv Stream. Travel to Lhasa, Tibet’s mystical capital, for visits to a local family home for lunch, a local bazaar, and the imposing Potala Palace, former winter home of the Dalai Lama. You will also dine in a local restaurant and be entertained with traditional Tibetan music and dance. 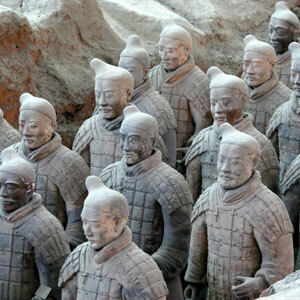 In Xi’an, see the famed Terracotta Warriors up close from a special VIP viewing area and learn how to write ancient Chinese calligraphy. Lastly, in Beijing, visit the Forbidden City with its Imperial Palace, sample authentic Peking Duck, and walk along the incomparable Great Wall of China. You will also explore one of the city’s ancient alleys by rickshaw and experience a cultural performance at the Peking Opera or the Legend of Kung Fu show. Welcome to China’s most populous city and center of trade and industry. Hotel rooms are available for mid-afternoon check-in. This trip is for travelers who are fit. You will visit regions reaching almost 14,000 ft. in elevation. Accommodations in the Gobi Desert are in traditional Mongolian gers with private bathroom and shower facilities. You are the reason we've used our 85-plus years of travel expertise to design the very best cruising experience. Inspired by you, we've taken everything special about small-ship cruising and made it even better. Here are some of the features and amenities you'll experience. Modern comfort and elegant design. Reserved seating for evening entertainment. Exclusive welcome reception with cocktails and snacks. Complimentary regional wines, beer, and soft drinks at dinner. Modern bathrooms with bathtub and shower. Exclusive shore excursions for Avalon passengers with Local Guide. Deluxe Stateroom with 266 sq. ft. of indoor living space. Private balcony with additional 35 sq. ft. of living space. Headsets for all sightseeing in Beijing, Xi'an and Shanghai. 24-hour access to the Executive Lounge with complimentary coffee, tea, and snacks. Complimentary Wi-Fi access in the Executive Lounge (when signal available). Breakfast and Lunch buffets in VIP restaurant featuring Western & Chinese cuisine. Dinner in VIP restaurant (excludes Captain’s farewell banquet) with your choice of a buffet featuring Western and Chinese cuisine or an à la carte menu. Captain's farewell Chinese banquet in the main dining room.